A picture has emerged of the way the landscape of the Isle of Sheppey has developed from the Neolithic to the post-medieval period, thanks to extensive investigations over a decade at the Kingsborough Manor housing development. The work was commissioned and funded by Jones Homes (Southern) prior to housing development. During the Neolithic period this was a ceremonial landscape, dominated by two causewayed enclosures. The 16 hectare site has commanding views to the south, west and north and this must be one of the reasons why the two causewayed enclosures were constructed here. After the monuments fell into disuse little activity took place for two and a half millennia, until the Middle to the Late Bronze Age when the site was used for rituals and burials. The coastline is now only 1 km north of the site, but in prehistory (when the sea level was lower) it was further north and the resources the land offered would have been very different. The land has been used almost exclusively for agriculture until the recent housing developments of the late 20th-early 21st centuries. 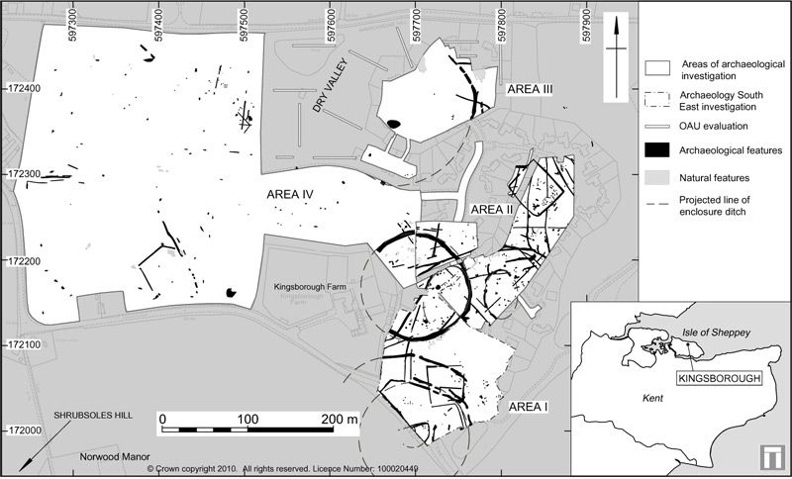 Jörn Schuster provides an up-to-date overview of the results of ten years of investigation in a recent article in Archaeologia Cantiana, 30, 2010, ‘The Neolithic to Post-Medieval Archaeology of Kingsborough, Eastchurch, Isle of Sheppey: from monuments to fields’. Two causewayed enclosures were constructed at either end of a spur on the ridge of this, the second highest point on the Isle of Sheppey. While K1 faced south towards the Swale, K2 looked north across the Thames estuary and the Essex coast beyond. The two were in use at the same time, but radiocarbon dates suggest that K2 was built first (3710-3635 cal BC) and K1 second (3660-3580 cal BC). Approximately one quarter of K1 was excavated. The profile of the ditches varied considerably, with some V shaped and others flat-bottomed, while most had clearly been re-cut and cleaned out while in use. A considerable amount of pottery and flint was found in the inner ditches, but little in the outer circuit. Segments of three of the ditches of K2 were excavated, and these too showed evidence of recutting and cleaning. Pottery and flint were found, including a number of ‘structured’ or ‘placed’ deposits. One of these consisted of a fragment of a ground stone axe, placed over a few pieces of animal bone. The axe is particularly interesting because the nearest source of the Palaeozoic Sandstone it is made from is either the Ardennes or Scandinavia. There are noticeable differences in both the pottery and flint from the two causewayed enclosures, leading archaeologists to believe that the two were used in different ways, with larger scale ceremonies taking place in K1 and smaller, perhaps private activities in K2. For almost 2,500 years the Kingsborough Manor landscape was little visited. The Neolithic enclosures silted up, leaving only traces of their banks and ditches visible. Then, between about 1430 and 970 BC two cremation cemeteries were established at the site. The first was in a line laid out with some care between the two causewayed enclosures, by then ancient monuments. The second cemetery contained a cluster of 25 cremation graves sited to the north east. Bronze Age enclosures and field boundary ditches criss-cross the area, part of an extensive area consisting of both open grazing land and rectangular fields for growing crops. 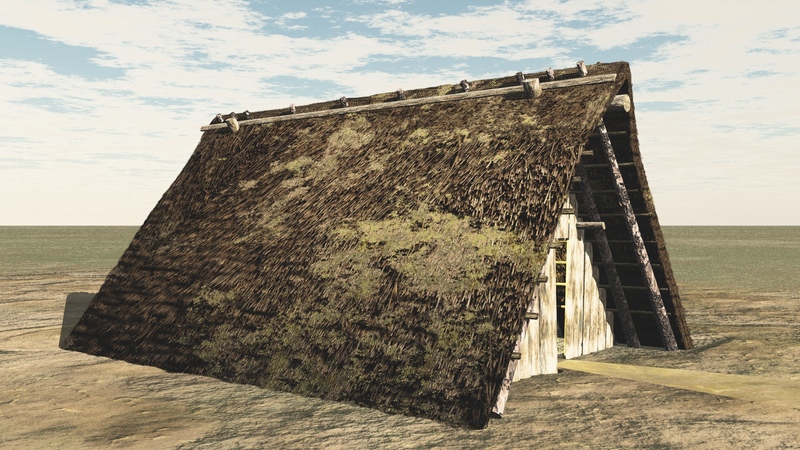 Several centuries passed before there was renewed activity on the site, but by the Middle Iron Age there were two enclosures there, each containing four-post structures. As well as burnt flint, fired clay and pottery, iron slag was found, suggesting that metal was being worked. Crossing one of the Bronze Age enclosures were two parallel ditches, probably a droveway dating to the Late Iron Age. To the north of it a puzzling set of 9 post-holes laid out in a 3 x 3 grid, 3 m square is thought to have been a granary or other storage building with a floor raised off the ground. The remains of field boundaries and droveways have been dated by the pottery found in them to the second and third century AD, evidence that the landscape was farmed at this time. Two second-century cremation graves were uncovered in the upper fill of the outer ditch of the Neolithic causewayed enclosure K1. Both graves had been badly damaged by ploughing, but one still contained three pots and the other, three pots and a glass bottle. A sunken-featured building was discovered to the north-east of the site. Charcoal found in the building gave it a radiocarbon date of AD 430-650. This is backed up by a small amount of pottery from the fifth to seventh centuries which was found in ditches and in a hole made by a fallen tree. A large dump of shellfish found in a ditch may have come from a settlement north of the ditch, but it could also be evidence of feasting on the hillside. Parallels exist: at Cliffs End near Ramsgate, overlooking Pegwell Bay, huge quantities of shellfish were found in pits. The pits had only been dug in places where the sea was visible. The sea is also visible from this ditch at Kingsborough Manor. Trackways and field boundaries dating to the 12th or 13th century give us a picture of rural farmland in the medieval period. But little trace is left in the soil to tell us about the area after the medieval period. Short sections of ditch, pits, brickearth quarries, tree-throw holes and a solitary bomb crater are all the evidence there is of the post-medieval history of Kingsborough Manor. Read the Phase 3 report here or download the full set of reports below.